Gatwick Airport, situated in southeast England, is a major international airport in the United Kingdom and the gateway to the British Isles. Originally opened as an aerodrome in the late 1920s, Gatwick Airport began scheduling commercial flights in 1933, and has continued to do so till today. Gatwick Airport (IATA code: LGW) serves the UK’s capital, London. It is the hub airport for British Airways. Gatwick Airport is the sovereign nation’s second busiest airport by passenger traffic, having welcomed over 43 million passengers through its doors in 2016. Flights to Gatwick Airport are available from international airlines such as Emirates, British Airways and Turkish Airlines. LGW is a 30-minute train ride from the city centre of London. Book your cheap flights to and from Gatwick Airport online! Gatwick Airport is one of the many airports serving London, the capital of the United Kingdom. Having been around since the 1920s, this international airport operates scheduled flights to all six of the inhabited continents of the world, and is the gateway to the nations of the historic British Isles. Gatwick Airport’s high traffic is even more amazing with just two terminals and only a single runway! For more of this airport’s history, spend some time at the Gatwick Aviation Museum, which contains the original items and photographs from the story behind Gatwick Airport. Compare and book cheap flights to Gatwick Airport with Virgin Atlantic. Engage in some retail therapy or shop for all your travel essentials at the variety of stores at Gatwick Airport. These numerous retail outlets sell a wide range of products, including cosmetics, fragrances, books, magazines, toys, fashion, accessories, electronics, entertainment, travel essentials, souvenirs, gifts and wines. Be sure to observe the baggage restrictions at this airport. For any minor health concerns, pharmacy outlets are available by the arrivals section and after security. When all your shopping’s done, satisfy your appetite with a range of different meal options at the great number of restaurants, cafés and bars at Gatwick Airport, that cater to every traveller’s dietary concern. If you’re at the airport after these restaurants close (at 22:00), you can still grab a bite to eat at the World Duty Free zone, which is available 24/7. Escape the crowds at Gatwick Airport by relaxing at the selection of lounges and clubrooms on the premises. These lounges include a range of features, such as bars, bistros, Wi-Fi, entertainment features and plug points. 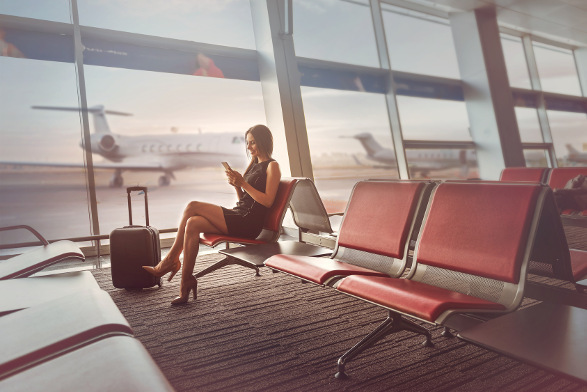 For corporate travellers, there are business lounges, courtesy of Regus Express, at arrivals and before security. They feature meeting rooms and shower facilities. Other facilities and services available at Gatwick Airport include the inter-terminal shuttle service to get you from the North to the South Terminal. Charging stations for laptops and mobile accessories are available throughout the airport. Additionally, there is a chapel and prayer rooms, currency exchange facilities, Wi-Fi internet, luggage storage as well as a lost property section. Hampton by Hilton London Gatwick Airport This contemporary 3.5-star hotel is situated in the North Terminal of Gatwick Airport. Its amenities include a 24-hour fitness centre, a business centre, coffee/tea in the common area, air conditioning, a laundry service, restaurant and a bar/lounge. Additionally, free breakfast and free Wi-Fi are also available. Hilton London Gatwick Airport This upmarket 4-star hotel is located in the South Terminal of the airport. Amenities available at this establishment are a 24-hour health club, a business centre, air conditioning, a garden, a computer station, 2 restaurants and 2 bars/lounges. Free Wi-Fi is available in the lobby. Windfalls Boutique Hotel This charming 5-star boutique hotel is a brief 10-minute drive from Gatwick Airport. The selection of amenities offered by this establishment include multilingual staff, a self-serve laundry, a garden and a bar/lounge. Additionally, free breakfast, free Wi-Fi and free parking are available. You will need to order foreign exchange (this can be done online) within 60 days in advance of the collection date. These orders can only be collected by the person named on the order form. Moneycorp outlets, as well as ATMs, are available throughout Gatwick Airport. Parking options available at Gatwick Airport include short-term and long-term parking bays, along with services such as valet parking and valet car care. Premium parking bays are also available, to give you the most direct access to the terminals. You can book your parking online. Gatwick Airport is 40 km south of London’s city centre. Taxis, buses, coaches, trains, bicycle routes, Uber as well as car and motorbike rental options are available to get you from the airport to your destination. Book your vehicle to start your trip!